These Scandinavian settlers had obtained 40-acre (16-hectare) blocks of land in 1872 and 1873 under provisions for special settlements laid down by the Wellington provincial government. By the 1890s, when this reunion was held, they were well established in the new country. I would love any information on the Broderson family . My relatives owned a farm near the railroad . I found a couple articles in the Mauriceville papers . Greetings. I 'm currently working on early Mauriceville history and wonder what is your source for identifying # 5 from left in the back row as Magnus Halberg? Other photos of this man here and in Larsen photos (his daughter married Lars Larsen) all identify him as Ole Amundsen. Back row # 9 (end) is usually written as Hakon or Haakon, the son of Niels Nielsen, below, both of whom emigrated on the England in 1872, along with most of the others. I am very interested to learn that this occasion is tied by your source to the silver wedding anniversary of Anna Maria and Janita and their husbands. Is this written on the back of the photo? 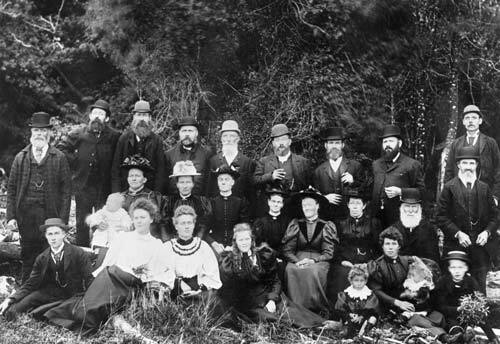 In the second row, #2 from left is usually firmly identified as Mrs Eli Swenson. Who is Gunda Christianson? The second wife of Gunnerius/der Christiansen # 7 is firmly Johannes Jespersen, not his son Julius. Very interested in identification of Aulin girls in front row. This photo was taken at the Silver Wedding anniversary of Nils and Anna Maria Anderson and Henry and Janita Aulins on 6th April 1897. They are; Back row. Christopher Ericson, John Swenson, Nils Anderson, Henry Aulin, Magnus Halberg, Peter Larsen, John Wellington, Jens Jorgensen, Haron Nilson. Middle Row; Mrs Ericson, Mrs Jorgensen, Anna Maria Anderson, Janita Aulin, Gunda Christianson, Mrs Wellington, Jasper Jesperson, Nils Nilson. Front Row; Johannes August Anderson,Christina Elisabeth Anderson,Kristina Elizabeth Aulin,Augusta Olivia Aulin. Magnus Halberg is said to be Sir Murray Halbergs Grandparent.